The duty of Tatmadaw members and security personnel is to protect the State sovereignty, the national interest and people of the country. Although the duty is entrusted by the Constitution, unlawful acts are not allowed. The task of shouldering the duty shall be within the framework of rules, laws and other directives issued by the State. 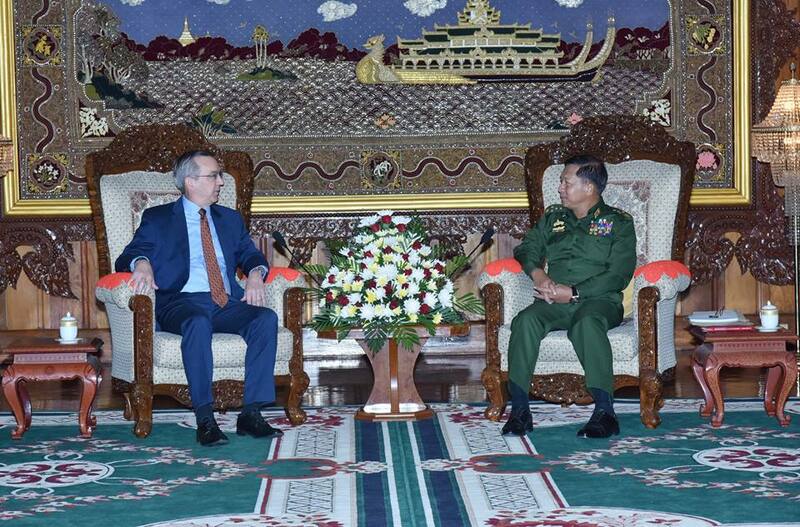 No action goes beyond the legal framework, said Commander-in-Chief of Defence Services Senior General Min Aung Hlaing at his meeting with Ambassador of the US to Myanmar Mr. Scot Alan Marciel at Zeyathiri Parlour at Konmyinttha, Yangon, this morning. 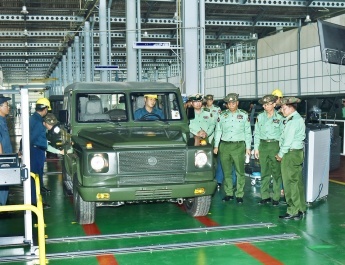 Also present at the meeting together with the Senior General were Lt-Gen Soe Htut and senior military officers of the Office of the Commander-in-Chief (Army). The US Ambassador was accompanied by Military Attaché Col Craig Tippins and officials. 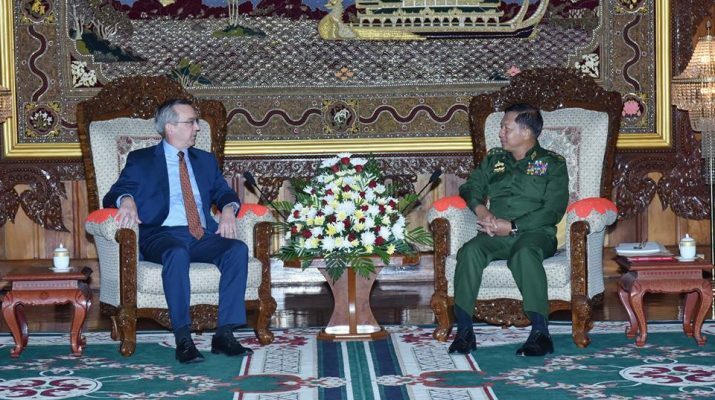 The US Ambassador expressed concern over the current situation in Rakhine State despite the knowledge about its history and its complexity. Regional as well as international concern about the fleeing of over 500,000 to Bangladesh caused pressures on Myanmar. According to some quarters, the exodus was the result of food shortage, local threats and torching of homes. They are even saying that security forces are using excessive force and committing genocide. As a friendly country, the US wants to make constructive approach in order to reduce pressures on Myanmar. He also asked information about the verification program. 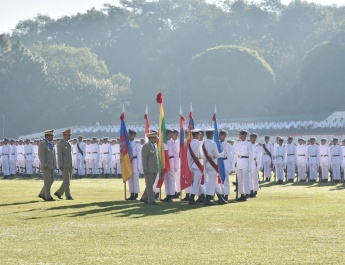 The Senior General said in accord with the people’s aspiration, the Tatmadaw adopted the current multi-party democracy system after introducing some adjustments. As it is the path chosen by the people, the people are the decision makers. The people’s decision is the decision of the Tatmadaw. As regards the history of Rakhine State, the Senior General said when the region fell under British colonialism in 1824 Bengalis from Bengal entered the region as farm labourers. More Bengalis came into the country as labourers for Buthidaung-Maungtaw railroad project during the colonial period. Those Bengalis permanently settled at the region. And later their population gradually increased. Latest record shows that Bengalis are the majority of the region as 95 percent of the region’s population is Bengalis. Rakhine and other natives have become the minority as they represent only five percent of the region’s population. The Bengalis were not taken into the country by Myanmar, but by the colonialists. They are not the natives, and the records prove that they were not even called Rahingya, but just Bengalis during the colonial period. The Senior General said in the latest terrorist attack, the extremist Bengali terrorists launched synchronized attacks against 30 police outposts and an army unit headquarters on 25 August. They also blew up eight bridges. Normally a police outpost has 10 or 15 persons. So an outpost had to defend itself without fail if a terrorist mob of over 200 holding sticks, knives, spears, and small arms attacked it. So security members fell and terrorist Bengalis also died in the attacks. According to information, about 4,000 Bengalis took part in the terrorist attacks. Bengali villagers followed the leadership of terrorists. Up to 8 October, the security forces now have exposed a list of 1,785 terrorists together with their names and villagers. The security forces have also information about the terrorist courses conducted before the occurrence of the attacks. It is clear that based on terrorist training, storing of food and attacks on police and military posts, such terrorist attacks were planned before that incident, the Senior General explained. 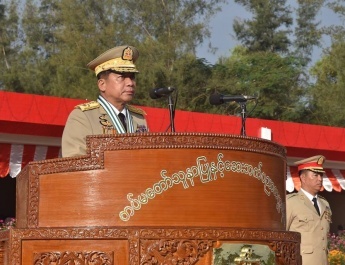 Regarding the reason for terrorist attacks, the Senior General said, national verification process was carried out for Bengalis in Rakhine State under the first-term government in the democratic period. But they didn’t accept it saying that they were Rohingya, not Bengalis. Not accepting the process means that there are lots of those born to illegal migrants and entry of illegal migrants. There are many Bengali families, each of which has about 40 members. Our country has the 1982 Citizenship Law for the citizens and the 2008 Constitution for the citizenship rights. The verification process must be carried out within the country not only for Bengalis but for all the countries bordering Myanmar. As for the exodus of Bengalis to the border of the other country, the Senior General said, in the August incident, over 90 Hindus were murdered and 45 bodies were found. Until now, there have been 192 people missing and they are assumed to have been killed. Moreover, local ethnics, security forces and service personnel were killed or fell. Those Bengalis who had relations with administrative and security organizations were also killed and there were over 30 deaths. According to investigation, local Bengalis were involved in the attacks under the leadership of ARSA. That is why they might have fled as they feel insecure. Some Hindu Bengalis and Muslim Bengalis fled to Maungtaw and Sittway as they feel secure. The native place of Bengalis is really Bengal. Therefore, they might have fled to the other country with the same language, race and culture as theirs by assuming that they would be safer there. When it comes to humanitarian assistance, the Senior General said that although refugee camps may be in need of food, there is a lot of farmland in the villages of Buthidaung-Maungtaw region. They have a lot of cattle. As the region is blessed with creeks and rivers, fish can easily be caught. The state government and relevant ministries are also providing food and rations. Tatmadaw and civilian medical teams are providing healthcare services for them. 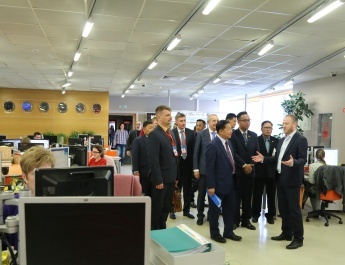 We also welcome help from the United States and contact can be made with the Rakhine State government and the Ministry of Social Welfare, Relief and Resettlement. For the issue of Rakhine State, a central implementation committee for Rakhine State peace, stability and development has been established under the leadership of State Counsellor Daw Aung San Suu Kyi, and the Tatmadaw is rendering help. Such incidents cannot be made up or hidden. Yet, there is exaggeration to say that the number of Bengalis fleeing to Bangladesh is very large. Particularly, there are instigation and propaganda by using the media from behind the scene. The real situation could not be uncovered because most of the media express as they wish by hiding the truth. The Tatmadaw is cooperating with the government for the good sake of the country. Real situations should be relayed to the foreign countries and relevant organizations. Those fleeing to the other country will be re-accepted in line with the bilateral agreement reached in 1993. Bangladeshi officials are due to come to Myanmar and the timeframe of accepting the Bengalis will depend on meeting results and the verification process, explained the Senior General by showing evidential photos. After the meeting, the Senior General and the US Ambassador had a documentary photo taken together with those present.